Just a handful of surfaces to cover, but the one thing about Gelli prints, or at lest the ones I tend to do, is they are rich with colour, not a lot of white space, so layering too much over them can be tricky. I’ll have to perhaps try a few ideas to see what I like best. Off for a hop in the morning – with DS home there can be competition for bandwidth so we’ll see how it goes. Categories: art, Gelli plate monoprints, WOYWW | Tags: Gelli plate, mini-albums, WOYWW | Permalink. Love the gelli book, still a bit (a lot) in the dark about what they are, just paint??? or….jelly? Never had a problem with band with in this house, all computers are never switched off! I cried when I had to pay £15 for the day in a camp-site, and all it was, was knicking some one’s else’s (VERY small and slow) bandwidth in the near by village! I could only get on line when they were! So that was BT for you, their log on to ‘Hot Spots’ for free was a BIG fib! 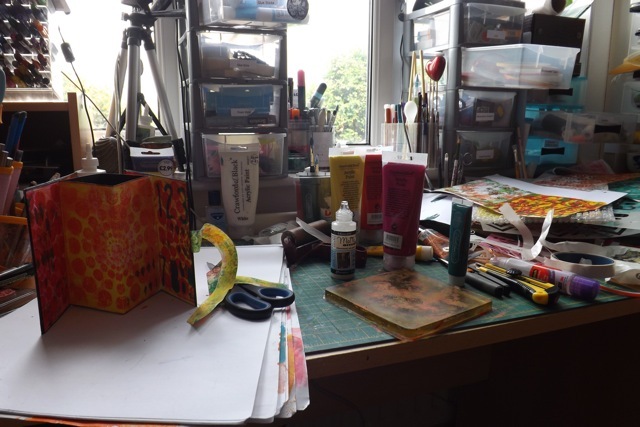 Anyway, love your colours on on gelli pages and your desk is nowhere near as messy as mine! Happy WOYWW sorry I’m late sometime wordpress asks for a pastword and I can never remember it, it’s different for every wordpress blog….I don’t know why! That Gelli book is delicious, Mary Anne! Happy WOYWW to you! Love your gelli book, the colours are super. Wow! Colour! Lovely. Paperwork does have the habit of getting in the way, doesn’t it? Trust it’s done now, and you can concentrate on crafting. There ‘can be’ competition for bandwidth. How frightfully English of you – I’m thinking Amercian here – there IS….!! Have ben without Internet for two days so am going to have to page back now, this Gelli book is fab. My gelli is erm..still wrapped! We love your Gelli bag and really must try something a little different with our prints. Marianne that’s not much of a mess you can make more than that!!!!!!!! Your gelli books are brilliant I just wish I had more time to get stuck into the art and play, I so love my gelli plate but don’t have enough time. Oh your colors are so gorgeous! I am so confused about these gelli plate things…will need to research a wee bit I guess!!! Happy WOYWW!